The Gray Report: Where do supermarket sale wines come from? Where do supermarket sale wines come from? Where do these wines come from? 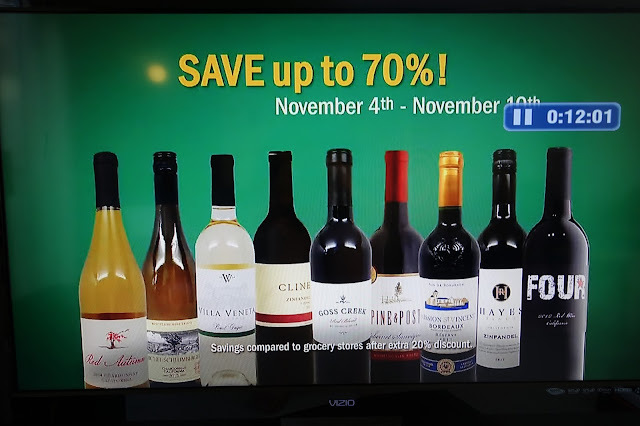 Last month on the morning news I saw an ad for a sale at a California wine supermarket. I paused it -- the miracle of DVRs -- and took a screen shot because I wondered where supermarket sale wines come from. Here's the screen shot of the 9 wines. Who makes these sale wines? How are they so cheap? Thanks to website of the federal government agency responsible for alcohol, the TTB, I was able to look up the Certificate of Label Approval for each wine. I answered some questions, but raised a few others. This was in the Wine of the Month Club, which helpfully rated it 94 points. A group of very enthusiastic wine tasters bought it for $2.99 and declared it "Goooood." It's made by Fior di Sole winery in Napa, which advertises itself as "Premium bulk wine from Napa Valley and other appellations." Remember that name. This used to be a real winery named after the owner, but in 2011 the winery was sold to the Adams Wine Group, an investment group. The winery does list respected consulting winemaker Kerry Damskey, but he is best known as a Mr. Fixit. So far as I can tell from a COLA search, the wines are no longer being made at the onetime winery building in Sonoma County; they're now being made at RB Wine Associates in Hopland, which has one of the emptiest websites you'll ever see. Bet you thought this was Italian. The photo on TV isn't clear enough to show the appellation, but whaddya know, it's made by our friends at Fior di Sole! This brand has been in use a long time; Wine Enthusiast gave the 2001 vintage 83 points in 2003, saying, "Feels a bit heavy in the mouth, but finishes clean and lemony." At Vivino somebody called it "another $4 Grocery Outlet find," and after some tasting notes that don't sound particularly appealing, wrote, "Much better than it's price point [sic]." How could it not be? This appears to be a wine really made by a family owned winery! It's an anomaly in this group and should be treasured. This is the most interesting label. I found three COLAs in the past five years. A red blend vintage 2011 was made at Domaine Alfred in San Luis Obispo. A 2014 Chenin Blanc was made at Lange Twins in Acampo (Lodi). The third, listed as a "Dessert/Port/Sherry/(Cooking) Wine," vintage 2013, was made at Seghesio Family Vineyards in Healdsburg. I'm not sure which wine is shown; probably the first but possibly the last. Historically, the Goss Creek brand was a second label for Domaine Alfred. In 2008, Domaine Alfred was purchased by the Crimson Wine Group, owners of Pine Ridge and Archery Summit. Crimson bought Seghesio in 2011, cutting off my supply of Christmas sausage. The Seghesios used to make homemade sausage every December, and sent me some for years after I spent a day working at the winery in 2005 for a newspaper story. So far as I know, the Lange twins still own LangeTwins, so I'm not sure what's up with this label. I just know I miss that sausage. This is straightforward: Pine & Post is made by Precept Brands, a very savvy company based in Walla Walla that makes a lot of private labels. Its wines tend to be on the sweet side, which seems perfect for this price point. This is mysterious because of the photo. It looks like a red wine, but the only label approval is for a white -- a 2013 Sauvignon. It's imported by P.G. Imports in Denver; the contact is well-known beverage alcohol attorney Robert Lehrman in Washington DC. P.G. Imports' web page mentions working with co-ops, and it makes sense that this would be a co-op wine, but I couldn't find it on their site. But this wine does exist in France; Wine Searcher shows it at a French retailer for $3.54 a bottle. If that's true, it's a pretty good deal at $9 in the U.S., considering the cost of getting it here. I'm surprised it didn't need a new label approval, though, as the last approval for a red wine was in 2006 for a different importer, The Wine Frog in Fort Worth, TX. This was the most unsatisfying label to look up. Is it a co-op? A wine made by a negociant, either here or in France, from bulk wine? I'm pretty sure there is no Mission St. Vincent winery, but I don't know who made this wine. Finding good results was complicated because of a fun wine-dominant restaurant right down the street from me, St. Vincent in San Francisco's Mission district. I recommend dining there; the owner knows where his wines come from. This is straightforward: Hayes Ranch is owned by Wente Bros, a family-owned winery in Livermore. Not quite as straightforward as Cline Zinfandel, but close. To Wente's credit, they're not hiding anything: the Snooth listing starts with "Hayes Ranch is a wine produced in California by Wente Family Estates since 2005." This was confusing at first because I thought the brand name is "Four," and Four Loko gave so many COLA results that they were difficult to wade through. When I narrowed the results to wine I discovered that the little star inside the R on the label means the brand is actually Four Star. It's made by our friends at Fior di Sole. Of course it is! This was such a dull conclusion at the end of my search project that I went back to look at the Four Loko flavors: Blue Raspberry, Cranberry Lemonade, Uva, Orange Blend, Fruit Punch, Peach. How would that last one do if you slapped a wine label on it and sold it at a wine supermarket? In looking up the supermarket sale wines, I noticed that nobody complained about them. Maybe they're all fine wines and they're delicious, but the main praise for them online is that they're good value. Put some very cheap, highly manipulated alcohol in a wine bottle and it seems like a great deal. Put some very cheap, highly manipulated alcohol in an aluminum can -- i.e., Four Loko -- and the gloves are off. The Dallas Observer ran a story on Four Loko last year in which Alice Laussade wrote about Four Loko Peach, "Plumeria Lotion From Bath & Body Works Out Of Your Great Aunt's Sweaty Cleave would have been a more accurate name for this flavor. Or Floral Couch Death." Nobody ever says that kind of thing about a bottle of cheap wine: instead we write that it's "Gooood" or "Better than it's price point" because we think it's a product with at least some level of sophistication. Check your privilege, wine. Interesting to read how you traced it. And apparently some consumers like to keep the illusion that they're getting something hand crafted by a small family somewhere. Personally, just give it to me straight up what's going on. Better I know where it comes from, so I can better evaluate it. Of course, I'm not your Joe/Jane wine consumer, so I guess that's why they aren't targeting me. Oh, and you should go ahead and get a bottle of the Cline Zinfandel, let us know how it is. Who knows, it might be a great simple Zin table wine! At least you should reward them for being straightforward and honest, as well as actually being from an actual winery on the label. These "fake" wines are the US wines you find everywhere in England for under 20 pounds. And this leads UK customers to think that this is representative of US wine. Industrial crap with hidden proveanance. kind of like Tilapia from mysterious origins, you don't want to know. Alice Laussade is a genius. Her restaurant reviews are even better. One of the difficulties with doing this, besides how much time it takes, is that the COLA search doesn't always tell all. The other thing that makes me crazy when I do this is that the COLA search doesn't tell you if it's a retail private label or another Big Wine brand. The former are usually less of a value than the latter. And to address Aaron's point, most consumers -- or at least enough so that I can guess that it's most -- assume all wine is made by small producers. It's one of the myths that even the entire industry perpetuates. Now look at a Total Wine ad flyer and look at similar quality wines. All the wines listed are private brands and labels of Total Wine or from a winery that paid some sort of quid pro quo to be in the advertising material. Isn't this against ABC law and how to the cover-up the quid pro quo payola: free goods, rebate checks, better pricing,etc. I would like to see a book on payola in the American wine industry. It i now like the record industry in the 1950's. Ha, this is just how the wine industry gives the people what they want. Cheap plonk with a fancy name - you don't get real, produced by wines from the North Coast AVAs for under $5/btl. You get press wine and kick-outs off the bulk brokers - which is fine, it serves a market. By the way... these Fior di Sole wines are from Ca'Momi - nice restaurant too. Not hard to look up.